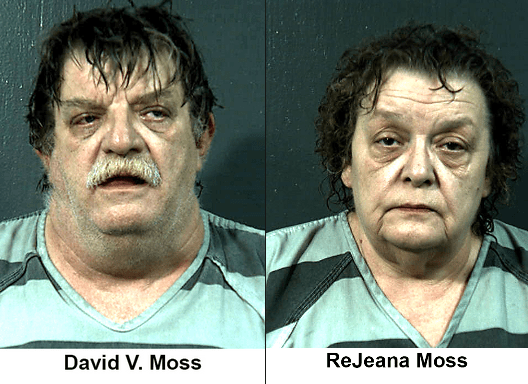 Two girls, ages 11 and 13, and a mentally disabled 17-year-old boy were imprisoned, starved, and physically and sexually abused by their adoptive parents, David V. Moss and ReJeana Moss. Their 9-year-old adopted brother was not abused. The children were homeschooled. The children were adopted around 2004, but the abuse did not begin until 2011 shortly after the Mosses’ two biological sons, who also report being abused, left the home. The three older adopted children were kept locked in their rooms with a bucket for a bathroom. The windows were boarded up and they were not given enough to eat. They were beaten so frequently with a paddle that it had bloodstains on it. The two girls were also sexually abused by David Moss. The abuse came to light in August 2013, when the two girls managed to escape from their room, took their parents’ car, and crashed it. They reported the abuse to the police during the investigation of the crash, and the four children were removed from the home in September 2013. The Mosses were indicted on several counts including kidnapping, assault, child endangerment, and sexual battery.